What are the new features of GWAVA 5? Verify the recipient exists on the mail server. Mail server will only see mail for users in an LDAP accessible data source (eDirectory/Active Directory). Provides users with access to the quarantine by authentication against an LDAP server (eDirectory/Active Directory). Seamless transition of mail scanning when primary server is down. Catch and scan overflowed mail. Ensures that downtime is at a minimum. GWAVA modules give out a periodic heartbeat. If a module does not respond, GWAVA restart that module. Keep statistics, alerts, and other useful information organized and easily accessible. Create a custom home page to suit your needs. The various gadgets help to maintain and monitor the GWAVA system. 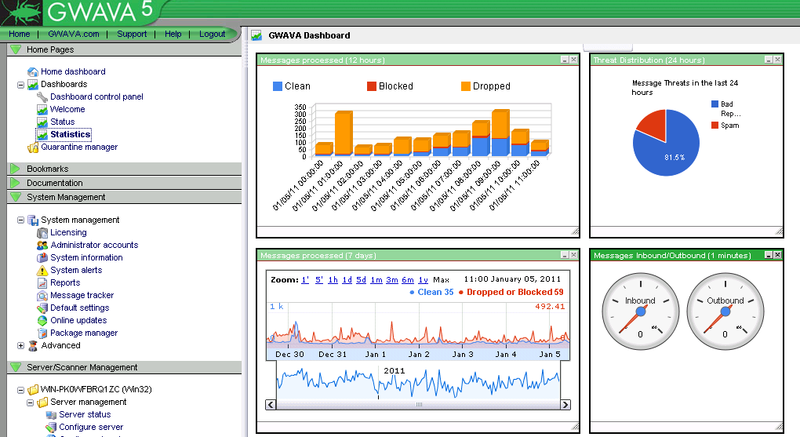 Generate reports on useful information about GWAVA. Reports are sent to specified recipients according to custom schedules. GWAVA is proactively on the lookout for problems. Makes administrators aware of problems, so they can be addressed in a timely manner. A helpful tool in server maintenance. Makes finding information about messages simple and easy. Gives information such as message ID, time stamps, source address, and block events. This article was originally published in the GWAVA knowledgebase as article ID 1938.